A couple of days ago I posted on our Facebook page about the weird case of Chinese actress Fan Bingbing's disappearance. 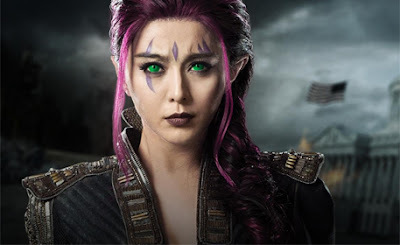 An international megastar with over 60 million followers on her popular Weibo account, Bingbing has been making inroads here in America, appearing in blockbuster films Iron Man 3, X-Men: Days of Future Past, and more. While not knowing her status has to be scary for those closest to her, it's also beginning to have an impact on all of the projects she is attached to, including Jessica Chastain's spy film, 355. First and foremost, let's all hope Fan turns up safe and sound. Rumors suggest she may have been put under a form of detainment or house arrest by the Chinese government over a tax evasion scheme. While no formal charges have been made public, and attempts to inquire about her status have fallen on deaf ears, it's believed Fan is being silenced and her financial issues used as a means to do that. Basically, Fan became associated with the practice of "yin and yang" contracts, a tax evasion scheme considered to be a major problem in the Chinese film industry. Long story short, two contracts are drawn up and signed, but only the one of lesser value is submitted to the government while the larger one is kept secret and put into effect. An investigation into these fraudulent contracts was launched in June, and it was in early July the last time anybody has physically seen Fan. She also hasn't posted to her Weibo account since June. Fan's uncertain status has led to her name being scrubbed from the marketing materials on future films, and in some cases they are being shelved altogether. Fan had recently agreed to star in 355 for the Huayi Brothers (this summer they've given us Peppermint, Mile 22, and The Happytime Murders), who invested a huge $20M to secure the Chinese distribution rights, largely based on Fan being attached along with Chastain, Penelope Cruz, Lupita Nyong'o, and Marion Cotillard. But without Fan, the film loses arguably its biggest international draw.